Let the games begin. Something tells me Mr. Cohen is about to pull some Omarosa snake moves and rat out the boss, especially if the deal still involves prison time. A lot of people ain’t cut out to do time. Can you imagine all the piping hot tea he possesses? So far he’s been fairly quiet but now that a deal has been sealed, all bets may be off. Do you think this plea deal will affect 45? End of the day I believe 45 recognizes he holds the ultimate ‘trump card’ – presidential pardon power. We’ll see if he uses it to free his Trump mafia friends. My message to the president: you better not talk about pardons for Michael Cohen or Paul Manafort tonight, or anytime in the future. 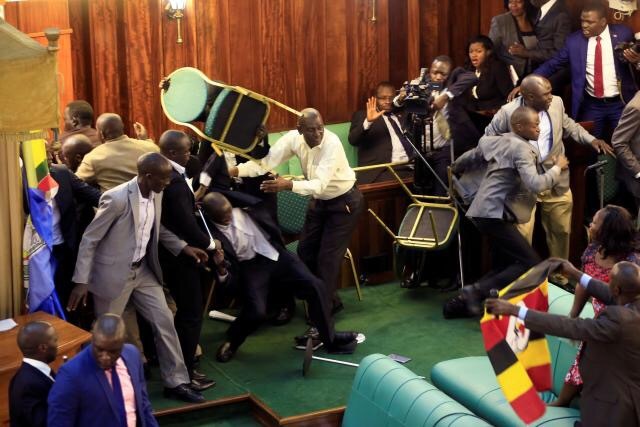 Ugandan politicians went to war for 2 days straight in a WWE tag team style brawl over the country’s presidential age limit. Reuters — Lawmakers brawled in Uganda’s parliament for a second day running on Wednesday over a fiercely disputed move to change the constitution to let long-ruling President Yoweri Museveni run for re-election after age 75. MPs exchanged blows and kicks, with some using microphone stands as crude weapons in the melee, and at least two female lawmakers were carried out of the chamber after collapsing, a Reuters journalist on the scene said. 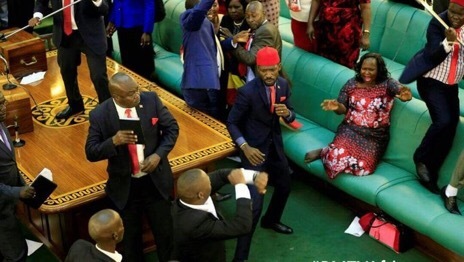 At least 25 MPs opposed to the proposed constitutional amendment to prolong Museveni’s tenure were forcibly ejected on orders of the speaker for involvement in fighting on Tuesday. All other like-minded MPs then walked out. After calm returned, ruling party MP Raphael Magyezi introduced the contested motion authorizing parliament to draft and present a bill that would lift the constitution’s age cap on presidential candidates. Under the existing constitution, eligibility to stand as a presidential candidate in the East African country has an age ceiling of 75. That makes Museveni, 73, in power since 1986 and increasingly accused of authoritarianism and a failure to curb corruption, unqualified to seek re-election at the next polls in 2021. Removing the age cap would erase that barrier. It’s really shameful that politicians and lawmakers can’t seem to come together and do their jobs without pure hellfire and brimstone unleashing. It’s unfortunate that they don’t seem as concerned about helping the people as they do “flexing their power” among each other, meanwhile WE THE PEOPLE are casualties of the war. 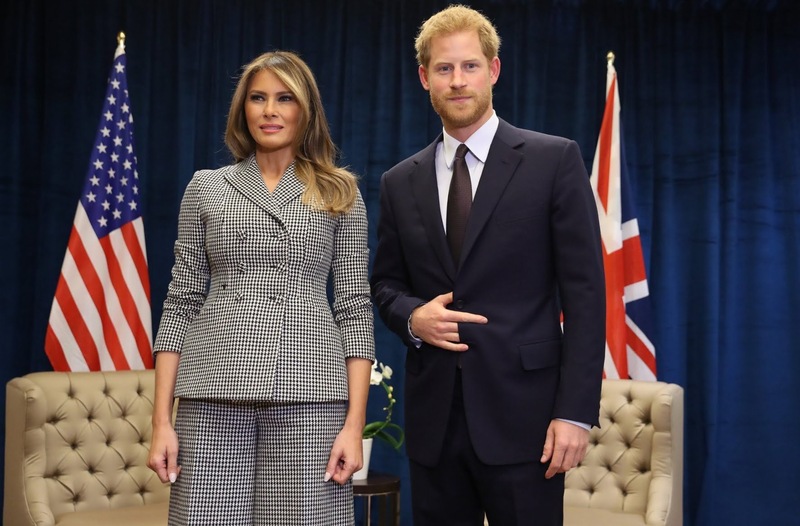 Prince Harry of England met with Donald Trump’s wife Melania, and flashed some weird hand symbol. If that’s not odd, what makes it completely odd is that it’s not like he held the ‘symbol’ for a second or two – he did it for a lot of seconds. Harry and Melania posed for a series of photos together before sitting down for a chat. Trump stood with her arms at her sides, while Harry’s hand was half-tucked into his jacket in a very unusual way: His ring and middle fingers were tucked inside his coat along with his thumb, while he held his pinky and pointer fingers outside. His unusual gesture ― and whether or not it was intentional ― became a hot topic over the weekend. 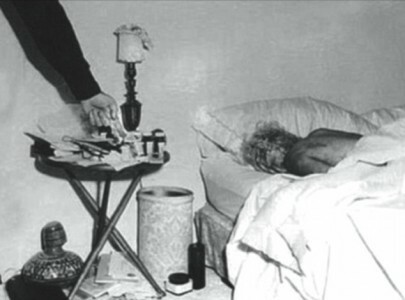 People on Twitter and some media outlets noted it looks like Harry was giving a symbol of the devil, either signaling that he himself is the devil or that the spirit of the devil surrounded him. But two body language experts think the gesture was misread in two very different ways. Patti Wood, body language expert and author of Snap: Making the Most of First Impressions, Body Language & Charisma, told HuffPost that while Harry has held his jacket in photos before, this specific hand position is new. Is he smirking? Maybe it’s a weird joke or dare? Is Harry just quietly throwing the classic heavy metal ‘devil horns’ to silently voice an opinion about Melania and/or The Trumps? Either way it is obvious that he is intentionally flashing this hand gesture. The question is why? According to metro.uk: “Conspiracy theorists such as David Vose believe that the ‘horns’ signal is just one of the ways our Illuminati masters communicate with each other.” Either way Melania seems clueless. So many questions and no one to answer. Social media dug up an old photo of former U.S. president George “Dub-Yuh” Bush flashing the same horn gesture, ironically during a photo op with Harry’s grandmother– Queen Elizabeth. What does it mean?